Famous home-computing pioneer, unsuccessful electric kart promoter and balding sugar-daddy Clive Sinclair has announced his latest product: a sit-down electric-assisted bicycle fitted with an egg-shaped plastic enclosed body. Yes! It's the battery-assisted bubble chopper! The machine has been dubbed the X-1, and deliveries are expected next summer, according to Sinclair's website. In essence the machine is a slight variation on the battery-assisted conventional bicycles already widely available. Like them it has two wheels, gets much of its motive power from being pedalled by the user, and supplements this with a battery and electric motor. 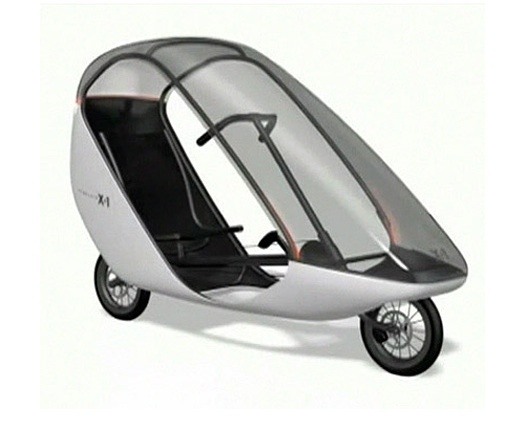 The only differences are that an X-1 rider sits upright with legs extended forward, much closer to the ground than a normal cyclist, and is partially enclosed in an acrylic bubble with integral roll cage. Compared to a normal battery bike, the X-1 doesn't seem to stack up too well, though it is cheaper than a lot of them. It is also less powerful (190 watts: most e-bikes are rated at 200-250 watts sustained and peak output - eg for hill climbing - over 500) and heavier at 30kg as opposed to low-20s. A mild advantage for the X-1 would be the partial protection offered from the elements, though the large open side doors would seem to offer plenty of chances to get drenched or splattered regardless - and there appears no way of keeping the windscreen clear in rain, either. The roll cage perhaps offers some safety benefit, though again this would seem to be counterbalanced by the much lower driver viewpoint and correspondingly reduced awareness of traffic. These questionable advantages would seem unlikely to justify a heavy, underpowered vehicle which will not slip through traffic or cope with potholes and other obstacles as well as a normal cycle. Then, having gone somewhere in the X-1, the option of locking it up like a normal bike is generally not going to be there - though you could argue that only a lunatic would steal it, there still remains the issue of space. It would block the pavements if you tried to treat it as a regular bike, and if you're going to need street parking you might as well get a motorbike or moped or car (electric if you like). All in all, the X-1 seems more likely to follow its famous predecessor the C5 into well-deserved ignominy than imitate the colossal success of the ZX Spectrum - Clive Sinclair's one genuine runaway success in a lifetime of developing tech products.